• Informing policy by supplying of anticipatory “intelligence” on the dynamics of change, future challenges and options as an input to policy conceptualisation and design. • Embedding participation in policy-making by facilitating the participation of different stakeholders in the policy-making process, thereby improving its transparency and legitimacy. • Supporting policy definition by jointly translating outcomes from the collective process into specific options for policy definition and implementation. • Facilitating policy implementation by building and supporting networks of stakeholders with a common awareness of the current situation, of the challenges to come and of desired visions of the future. • Reconfiguring the policy system in a way that makes it more apt to address long-term challenges. “Informing policy” refers to the supply of anticipatory knowledge or “intelligence” such as the dynamics of change, future challenges, risks and opportunities, strengths and weaknesses of the current system for addressing these, visions for change and possible options. The aim is to improve the knowledge base for thinking about and designing policy. Furthermore the provision of a wide range of new ideas stemming from a creative process which activates a diverse range of knowledge sources is an important aspect of informing policy. “Informing policy” has long been considered the core function of Foresight and its outcomes are traditionally synthesised into formal products such as reports. As well as direct policy recommendations such as priority lists and action plans these products may comprise information contributing to policy design in a more indirect way, such as scenarios of possible future developments, roadmaps towards different possible futures, lists of critical technologies or descriptions of visions of desirable futures. See also the EFP Brief 182 European Innovation Policy as a practical example of this Foresight function. In a context where traditional expert-based risk management practices are being questioned, Foresight can contribute by embedding the participation of civil society within the policy-making process, thereby improving governance in a multi-layered and multi-actor policy arena. It can increase the transparency and legitimacy of the policy-making process, and thus the acceptance and credibility of policy decisions. This is particularly important when there is growing demand for accountability over government spending. This function is closely related to the previous one as the involvement of a diversity of stakeholders within the intelligence-gathering and vision-building process also improves the legitimacy of the policy-making process. More information on the practical guidelines or approaches for participatory processes can be found in the Participatory Methods Toolkit – A practitioner’s manual (How can participation be organised? What methods are available and when and how are they applied? What are the implications for the budget and staff?). See also the EFMN Brief No. 141 RTI Policy in Vienna as a practical example of this Foresight function. It is often felt that anticipatory intelligence is not easily translated into options for policy definition, all the more so if this intelligence is produced by the twists and turns of a collective process. 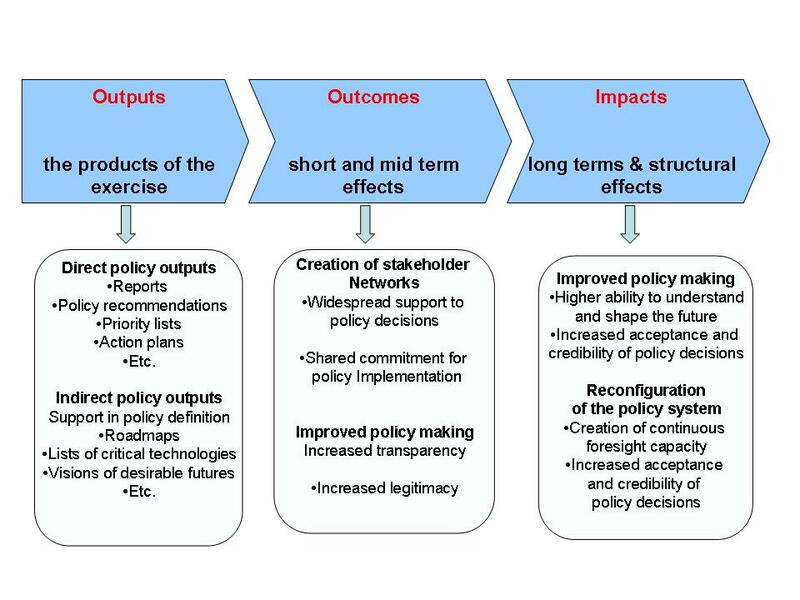 “Informing policy” and “facilitating policy implementation” may not be enough to ensure an effective contribution to policy definition and implementation. Policy-makers might for instance be reluctant to communicate their hidden agenda and to spell out their needs to participants who may have little inkling of what the policy-making process actually consists of. Therefore, “supporting policy definition” or “strategic counselling” has to be considered explicitly as an additional function. This implies that Foresight practice may extend its field of intervention “downstream”. This translation of anticipatory intelligence into options for policy definition has to take place jointly with the policy-makers in charge of the specific policy field. However, it might be necessary to complement Foresight with approaches aiming to steer the process of change towards specific objectives such as “transition management”, if it is developing into an instrument for assisting policy conceptualisation as well as implementation. See also the EFP Brief No. 174 German BMBF Foresight as a practical example of this Foresight function. The term stem originally from political science and policy making and signifies the setting of priority topics within a predefined policy cycle. In the context of Foresight, it can be a public or a private (corporate) agenda where priorities are defined. In the process of defining such priorities, usually a set of stakeholders is involved to discuss and agree upon the individual topics and the timeframe in which the topics should be pursued. Besides supplying specific information as a support to policy design, Foresight attempts, to some extent, to transform the field made up of the diverse actors and organizations concerned with the issues at stake. The Foresight process is seen as enhancing the capacity of the system under consideration (e.g. a territory, an industrial sector, a national research and innovation system) to change in step with the specific policy. As, from the policy-maker’s perspective, the main benefit of such an effect of Foresight is that there are better prospects of a smooth implementation of policies due to a better responsiveness of actors in the field, we have termed this function “facilitating policy implementation”. The Foresight process fulfils this function in various ways: Foresight is reckoned to be effective in creating linkages, interfaces, knowledge flows and networks between people or entities that may not have other opportunities to meet and exchange views and may have opposing interests. Furthermore, it is expected that through the collective reasoning about the future, different interest groups can develop a shared understanding of the current situation, the issues at stake and the future challenges. Indeed they may even share visions on desirable futures. The participants in the Foresight process will develop more “future-oriented” attitudes, will make better informed choices and will be ready to better accept and encourage changes in the right direction. As a consequence of the increasing complexity of the systems involved, the traditional linear model of policy-making as a process incorporating successive phases such as conceptualisation, implementation, evaluation and then modification to start a new cycle, is no longer adequate. Policy and strategy development are increasingly being interpreted as a continuous reflexive learning process. See also the EFMN Brief No. 98 Technology and Innovation in Flanders as a practical example of this Foresight function. • They can also draw attention to the inherent tension between the departmentalised (or ‘compartmentalised’) government structures, on the one hand, and the ‘multi-dimensionality’ of the issues (S&T, cultural & social, political, economic, environmental) which are cross-cutting the well-established structures, on the other. Concretely, public resources – financial and intellectual ones – should be pulled together to make a real difference in an efficient (co-ordinated) way. Yet, they are allocated to different ministries and other government agencies, and these organisations are not always keen on co-operation – to put it mildly. Therefore, Foresight exercises may raise the issue that a reconfiguration the policy system is needed in a way to make it more apt to address the major challenges and in the most favourable cases, this reconfiguration will actually take place. For instance, one can bring to mind the committees set up in the recent years between the Ministry of Education and Research and the Ministry of Industry of various countries to address innovation-related issues, or between the Ministry of Environment and the Ministry of Industry to tackle global warming. In this sense, Foresight is supporting reflexivity and learning in policy-making to adapt to changing context and challenges. New linkages can also be established with entities outside the policy system itself, such as NGOs, trade-unions or professional organisations. In this sense, policy is becoming less steering but more mediating within a complex governance system. See also the EFMN Brief No. 8 Foresight Embedding in Malta as a practical example of this Foresight function. Under certain political conditions Foresight also performs a symbolic function. By launching a Foresight exercise policy-makers may wish to signal to the public that their decision making is based on rational information. From the Foresight perspective this function poses some problems. It has been argued that the prevalence of the symbolic function of Foresight is likely to hinder any kind of “policy informing” impact. It may also lend support to arguments that Foresight exercises are sometimes undertaken with the sole aim of providing justification for a policy which has already been decided. However, it is crucial for the Foresight practitioner to be aware of the relevance of the symbolic function from the policy-maker’s point of view and to take it into account when designing the exercise.